​622 W Des Monies Street, Brooklyn, Iowa. 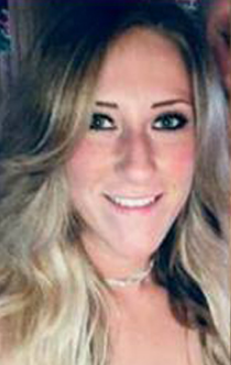 Mollie was last seen by neighbor when she went out for a run. Mollie had a field trip at work the next day. The red shirt she was suppose to wear is missing. By clicking on the down arrow to the left of any folder will open and close the folder and its grouped elements. Clicking the eye in the far left gray column will turn elements on and off within the map. 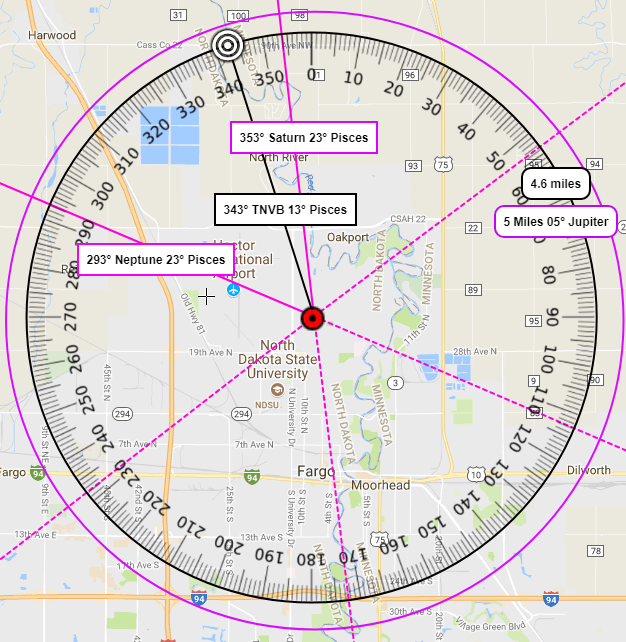 Radius' are for potent Distances and Vectored Compass Bearings are for potent Directions. 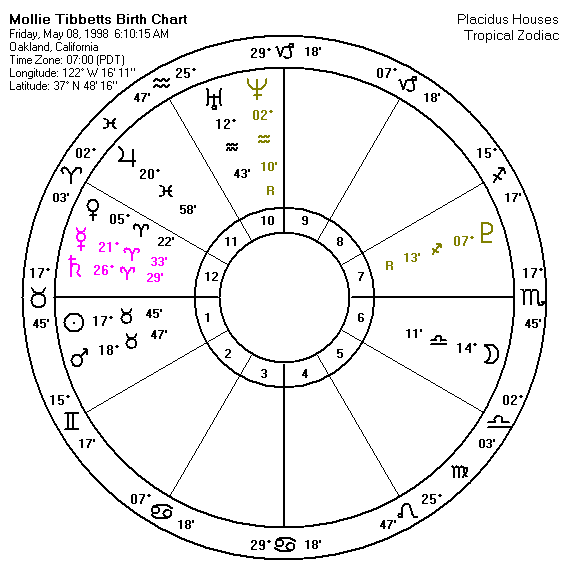 Blue or Dark Pink will signify the vectors for the Birth Chart of the missing victim. Use can use the search bar to enter addresses of interests and cell ping locations to check against the patterns in the Directions folder. 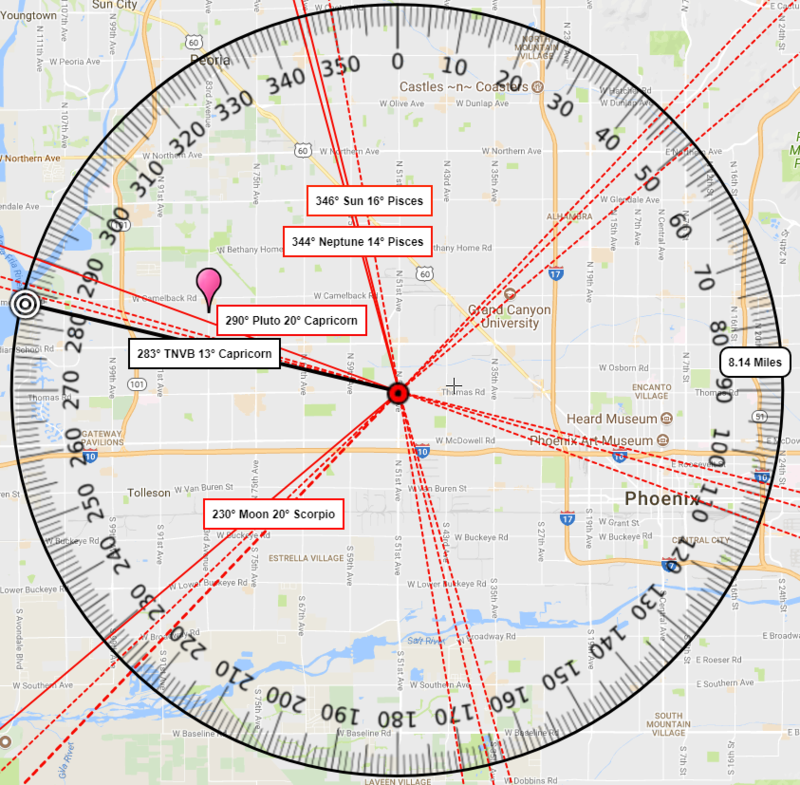 Your analysis of our map should be incorporated with the facts coming to light during investigation. 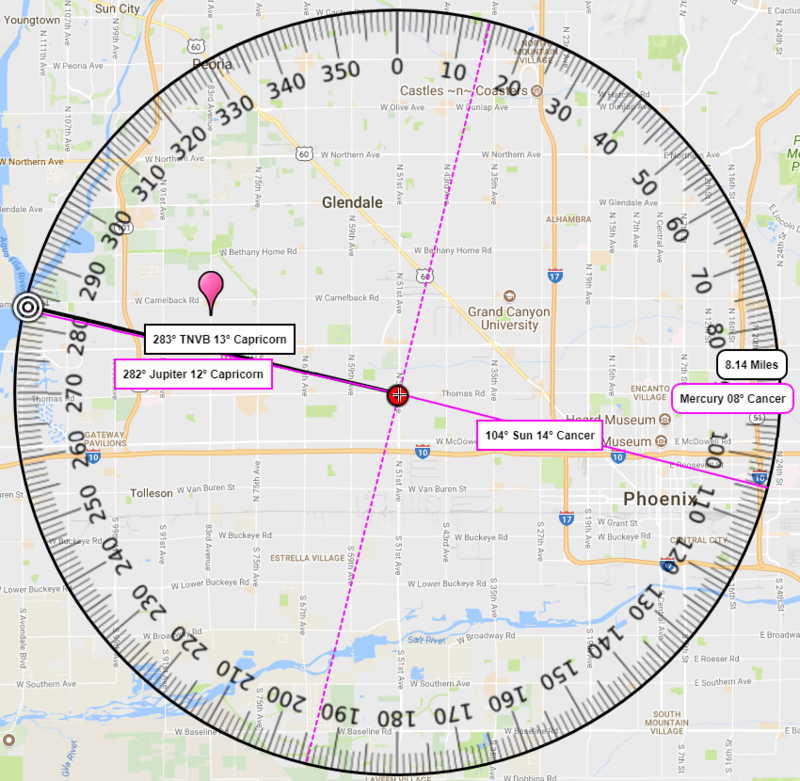 Be sure to always refresh your Browser so this page and map is up-to-date---as it could still be a work in progress. 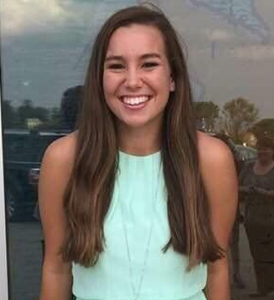 Link to Interactive Map in the Matter of Mollie Tibbetts be viewed in its own Browser window for best viewing. 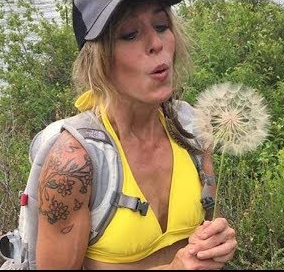 If Mollie was born sometime around the Noon hour her Moon would have progressed to the 19th degree of Cancer, which can otherwise be written as 109°. 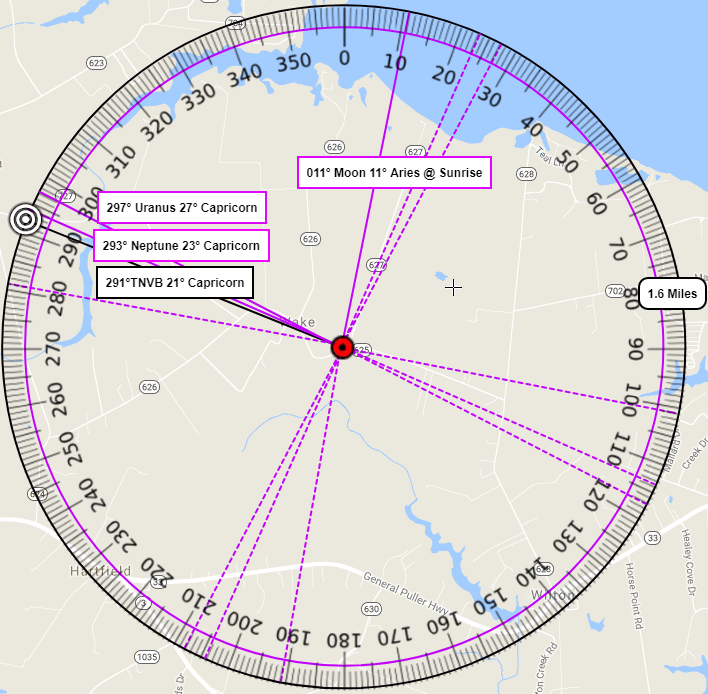 Note: Asc/Mid/Moon - will change based on the exact time she was last seen. 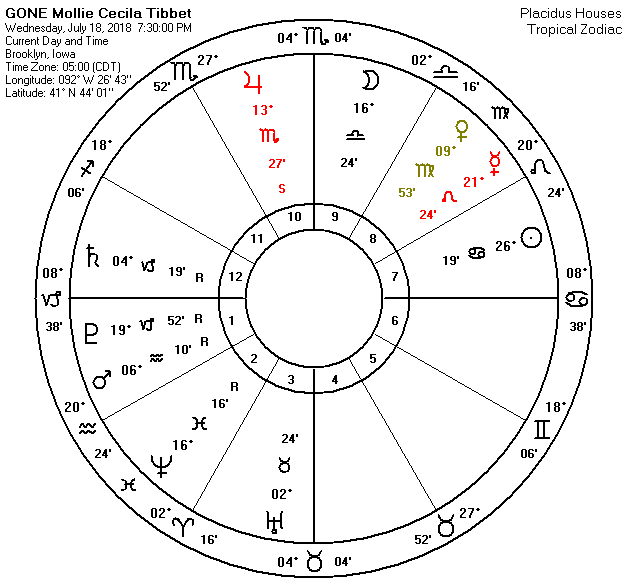 Note: No Time of Birth to exact Moon, ASC or Mid. 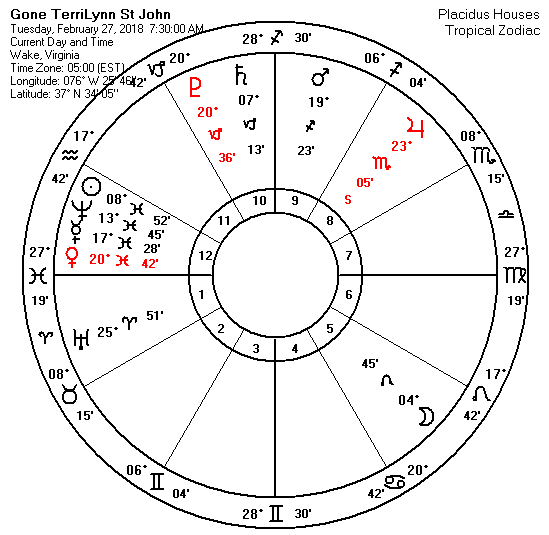 Sun/Mars Taurus CONJ in Square to Uranus--triggered by both a Square from Mercury, and an opposition from Jupiter. 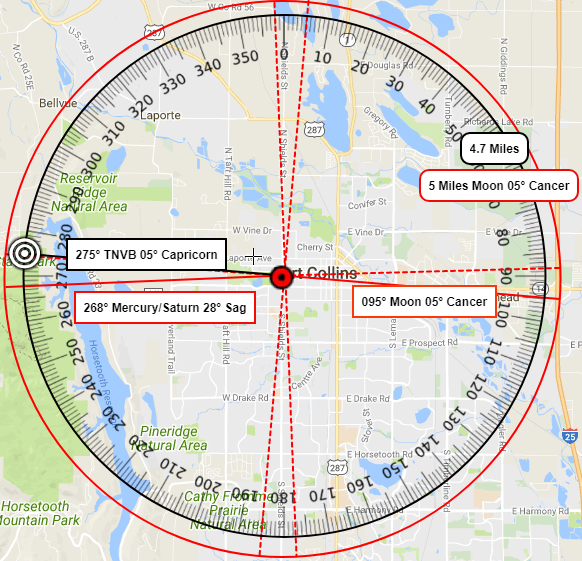 Mercury/SaturnAries CONJ triggered by a Sun Transit Squaring exactly. 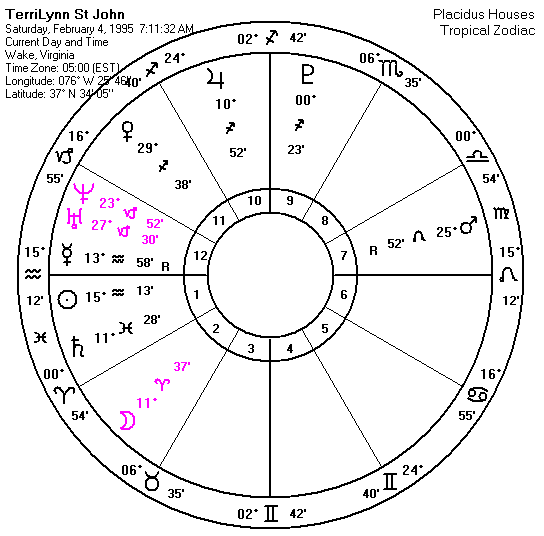 Progressed Sun opposes Pluto triggered by a Trine from transiting Mars Retrograde. 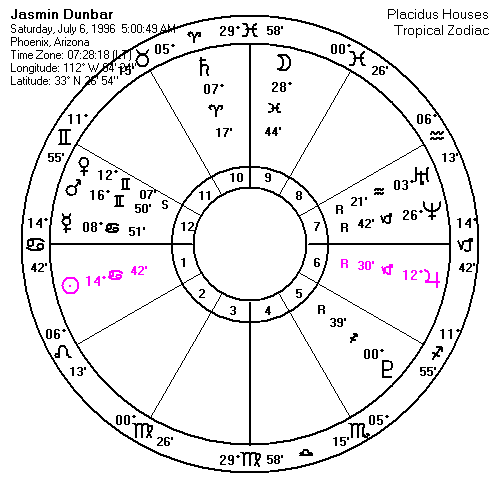 Possible Progressed Moon Pluto tight if born after Sunrise on day of birth. 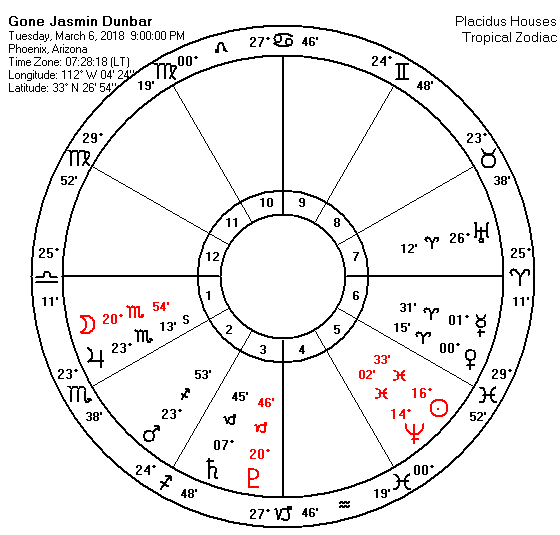 Progression of Sun Mars in Gemini strongly suggests she knows him---suggests a neighbor, or a connection to through family somehow of people living in the home or in the neighborhood or someone she knows. This is not a stranger. Folks in town might know this male or males as being emotionally immature or referred to as an imbecile or imbeciles. A battle took place, look for bite marks on the local males. Bite marks can figure in somehow. 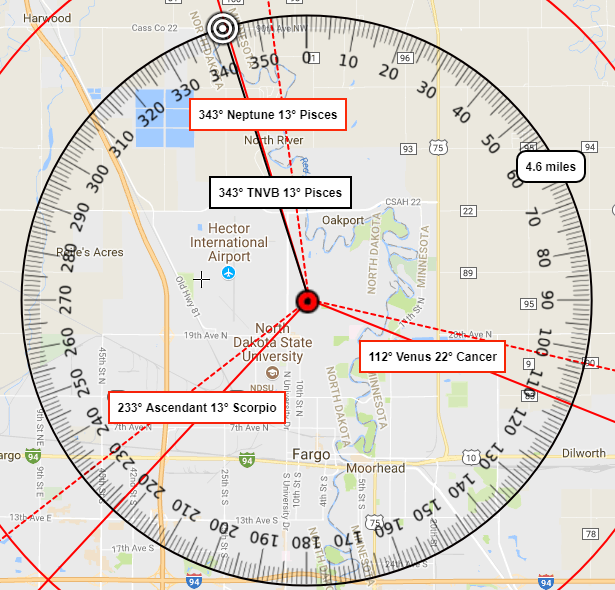 See Vectors in Map for Locations---but pay attention to these numbers in her Longitude Grid Chart. Note: An exact Time of birth could help with the temperature of location --and a person or persons of interest. 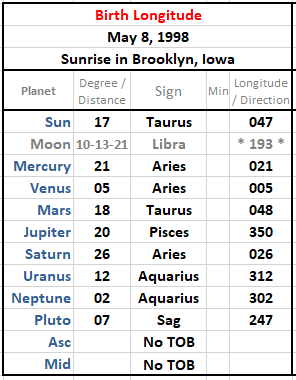 Sun in Taurus with Mars in Taurus and they are a conjunct---look for a Bull type stature. 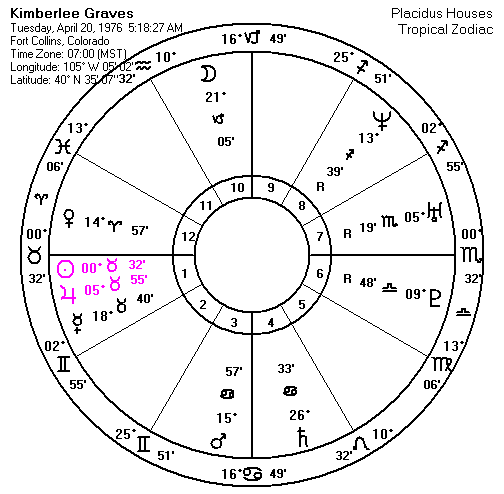 Meaning solid and stout, thick in body---hair should be dark in color----but the eyes, they could be blue or green, because at the time of this disappearance the Sun and Mars have progressed into Gemini giving a lighter color to the eyes, and possibly the hair. 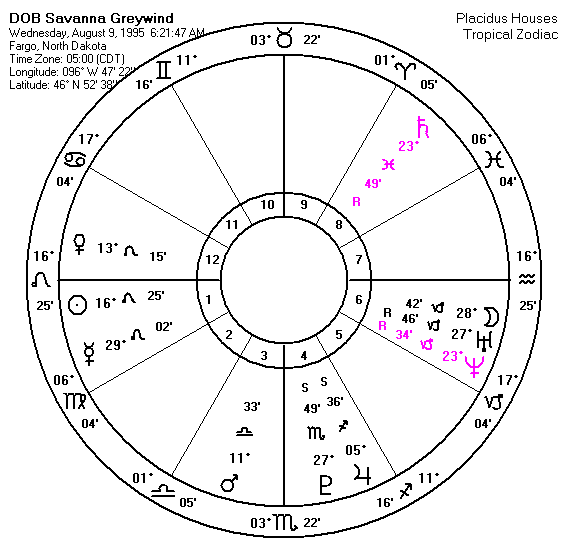 The Gemini connotation suggests that she know hims, he's local (or they are local) ---when anything in our own birth charts are in a sign that is mutable/dual such as Gemini, Virgo and Sagittarius---there is a good chance that there could be more than one male involvement. 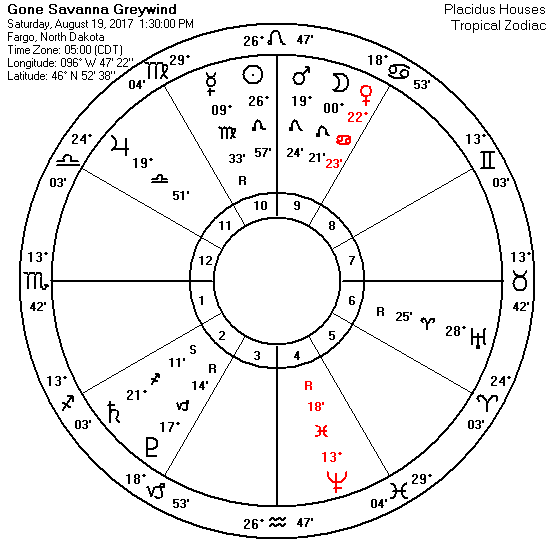 The Sun at the disappearance was exactly in trine to her own MercurySaturn Aries conjunction, and could very well indicate being tied and restrained by a Male/males. 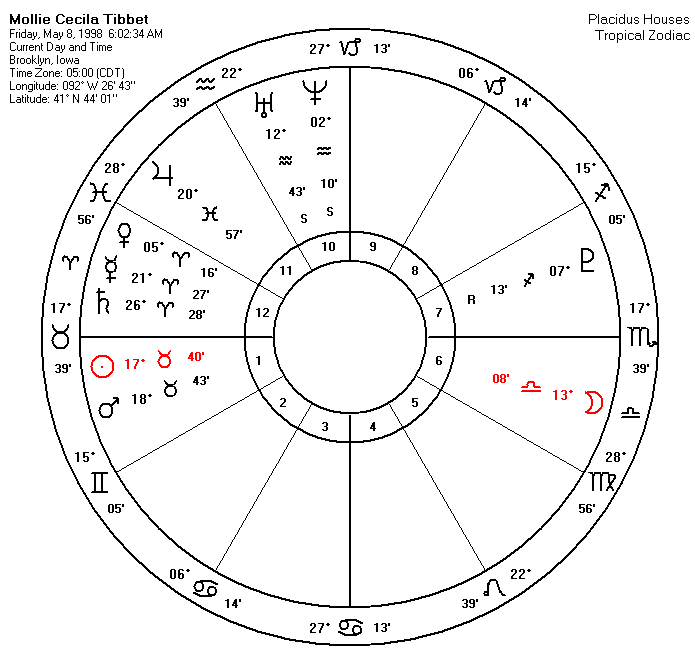 Mars at this time is in Retrograde motion---emotional unsound males tend to go off the cliff during a Mars retrograde---both sexual and aggressive desires tend to be misguided and misdirected. 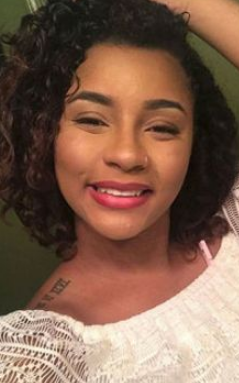 So you might want to look for a males or males who have had a marked romantic interest in Mollie for a long time---they could becoming off the rails emotionally and have a tendency to violence at this time. Check potential male persons of interest with dates of birth to be sometime late July and Early August when the Sun is in Leo. 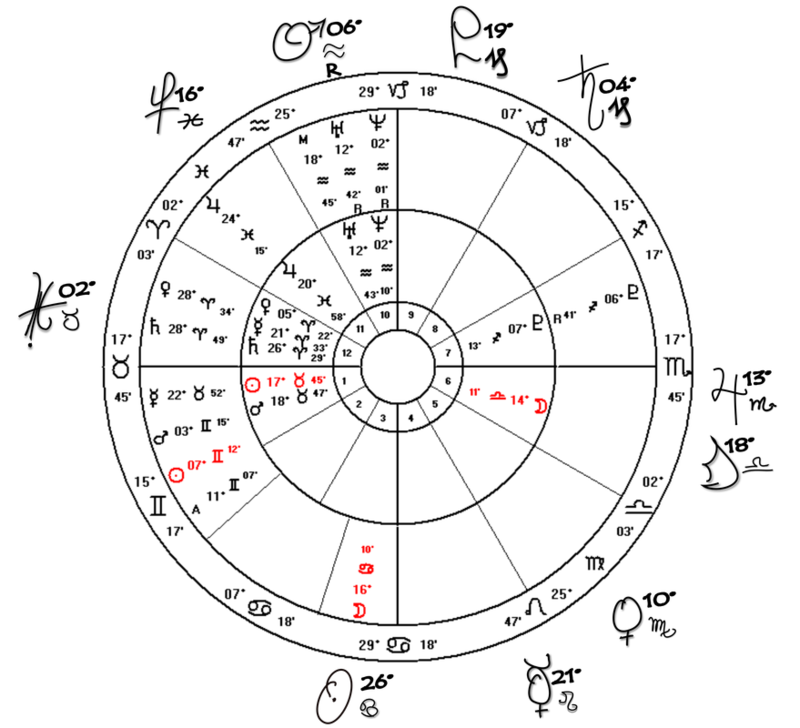 This Sun's placement in Leo would form Square aspects to Mollies own SUN/MARS in TAURUS, and it would form a conjunction to her own MERCURY at the 21st degree of Leo. 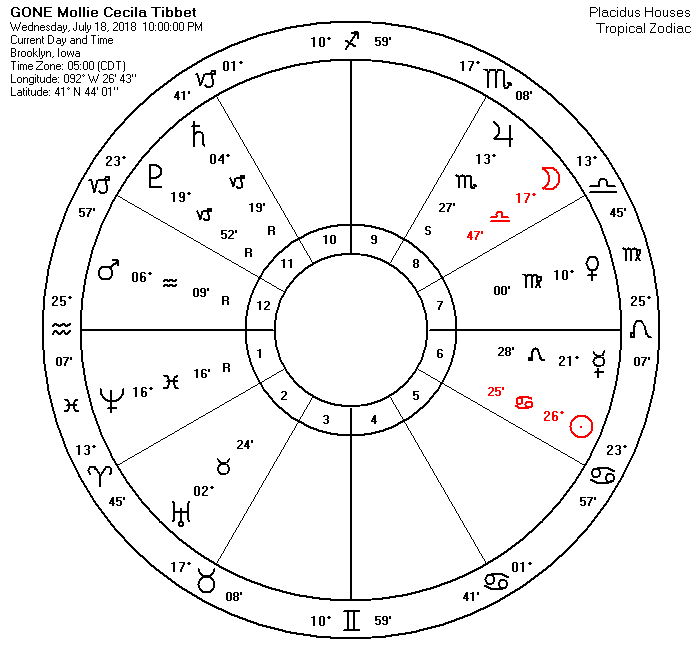 Understand, that the person responsible for her strange disappearance will have a tight connecting birth planet to one or more of Mollie's own star placements. So this could help to narrow down a person of interest. To tighten his date of birth down further, it could be a measuring longitude number at her birth-----looking for a date a birth for late July early August, I see that. 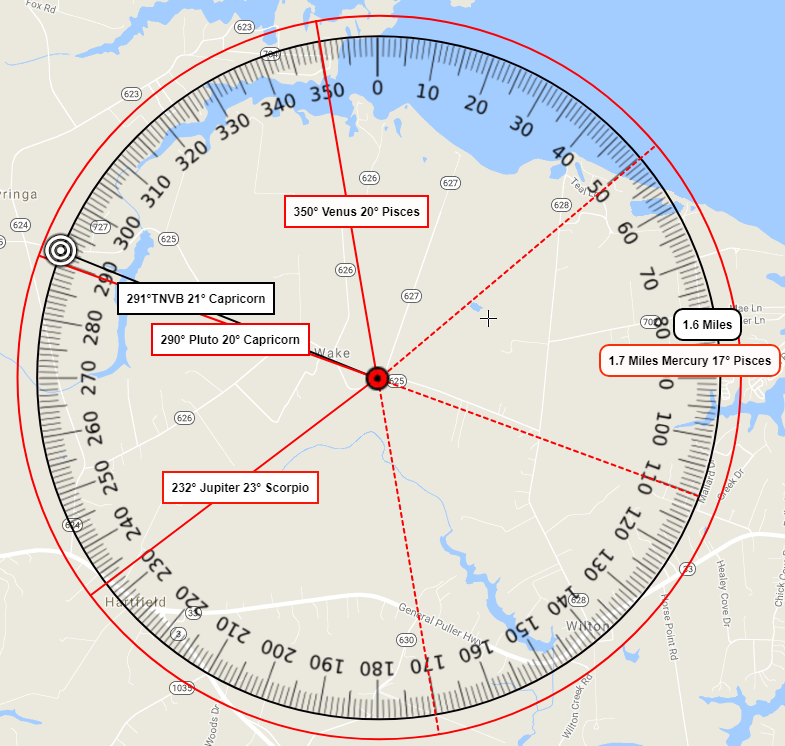 Her own Mars' measurement of 048 could make it an August 4th date of birth, or 8/04. 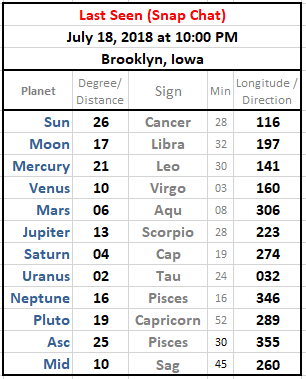 It's interesting that her own Venus at birth has progressed to be conjunct Saturn and both holding the 28th degree of Aries---in total degrees of longitude they measure 028---which could be the date 8/02---August 2nd. His age could also possibly be 26 or 28 years old represented by these measurements. Her own Sun measures 047, so perhaps a 7/04, or July 4th, date of birth. 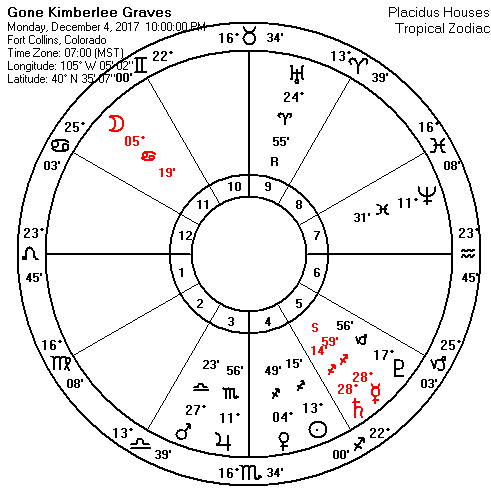 Or 4/07 or 4/08---giving him a fire Sun in Aries that would trine the Leo points, and for Aspects to her Mercury. If all males she knows are cleared, you might want to think locally, in terms of places where construction might be happening where there is a outside crew holding up in one of the hotels for an extended length of time, and who, during the course of her jogs, caught his attention while he frequented local establishments. 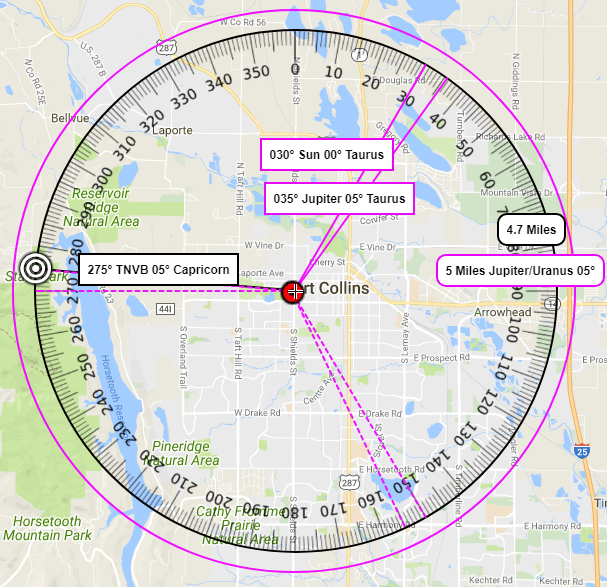 No planet by transit or in her own birth chart suggests that this person responsible for her disappearance would be someone that was just driving through and stopped in this little town. 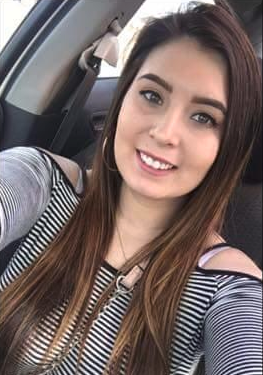 Syntax Analysis on the name of MOLLIE CECILIA TIBBETTS in progress for help on whereabouts and person of interest. 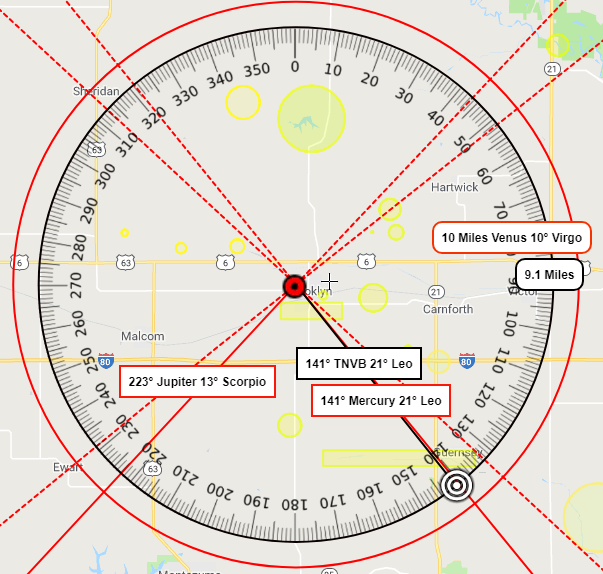 See the map illustrations below to view how planetary patterns at the time of a victims disappearance and birth offered the direction and the near distance to the point of recovery. 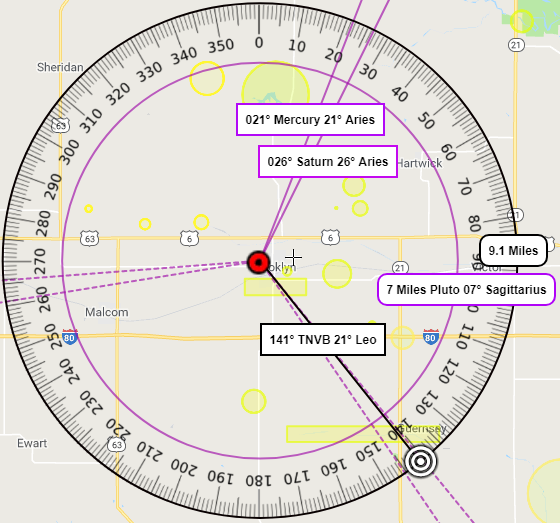 Planetary Pattern: Mercury Saturn conjunction with Mercury having the closest vector to POR by 0° of orb.